kt literary » Blog Archive » Happy Book Birthday to Michael J. Martinez! Happy Book Birthday to Michael J. Martinez! 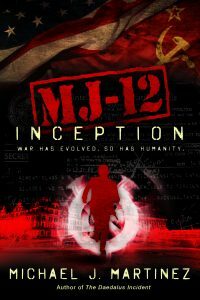 Please help us congratulate Michael J. Martinez on the launch of his brand new series – MAJESTIC 12: INCEPTION hits bookstores today!! “It’s a smart look at a Cold War in many ways even colder and scarier and deadlier than the one we barely survived.” — Harry Turtledove, New York Times bestselling author of Guns of the South. A team of superhuman covert operatives emerges from the ashes of World War II in a Cold War-era paranormal espionage thriller from acclaimed genre-bender Michael J. Martinez. It is a new world, stunned by the horrors that linger in the aftermath of total war. The United States and Soviet Union are squaring off in a different kind of conflict, one that’s fought in the shadows, where there are whispers of strange and mysterious developments. . .
Normal people across the United States have inexplicably gained paranormal abilities. A factory worker can heal the sick and injured. A schoolteacher bends emotions to her will. A car salesman alters matter with a simple touch. A former soldier speaks to the dying and gains their memories as they pass on. They are the Variants, controlled by a secret government program called MAJESTIC-12 to open a new front in the Cold War. From the deserts of Nevada to the palaces of Istanbul, the halls of power in Washington to the dark, oppressive streets of Prague, the Variants are thrown into a deadly game of shifting alliances. Amidst the seedy underbelly of nations, these once-ordinary Americans dropped in extraordinary circumstances will struggle to come to terms with their abilities as they fight to carve out a place for themselves in a world that may ultimately turn against them. And as the MAJESTIC-12 program will soon discover, there are others out there like them, some with far more malevolent goals. . .
← A Huge Welcome to Heather Carver!